pages-articles.xml.bz2 â€“ Current revisions only, no talk or user pages. (This is probably the one you want. The size of the 13 February 2014 dump is approximately 9.85 GB compressed, 44 GB uncompressed). There is also a much larger version avaiable wich has all the versions of all the pages, but that was beyond the capabilities of the psueudodistributed cluster on the CentOS server in my basement. Wanting to treat this file as a collection of pages presented a bit of a mismatch with the default hadoop inputFormat. This default reads one line as one input to the mapper. In order to have one page be one mapper input, an XmlInputFormat.java extention to the Inputformat was necessary. This set of programs uses the "new" functions... the ones which had come in by the time I started with hadoop ver 1.2. They use the org.apache.hadoop.mapreduce. bla bla bla imports, not the deprecated .mapred imports. These methods have been tested on both ver 1.2 and ver 2.2.0 The mapper mimics the classic hadoop word count behavior by outputting a the page length as the Key, and the value is 1. I did not implement a combiner. The reducer adds up how many pages have the key's length. When I got to looking at the output (with R) I observed that the number of pages for a small range of page sizes was quite tight. A correlary to this is that in the span from page-lengths of 357 to 31060, there is no number of bytes which has no pages. To me this says that something something about statistical mechanics has crept into the population of wiki page authors and revisers. 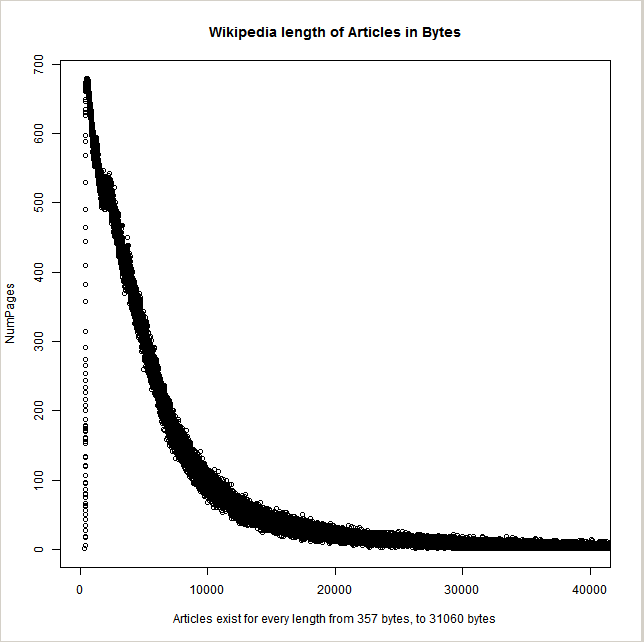 There are a few pages which have over 1.7M characters, these are wikipedia log files: things which record who did every update on which page and such like. I attached the code for the job file, the mapper, the reducer, and the XmlInputFormat below. The I admit that the XmlinputFormat does not give the exact number of bytes in the page... I cleaned up a few multiple spaces at the beginning of each line. I also substitutes spaces for Carridge returns, linefeeds, and tabs. Copy and use the code freely. Attribution to TPMoyer is appreciated, but not necessary. * output value is all the lines between <page> and </page> catenated into one line. * This value has had all  cr's and lf's and leading spaces purged. "mpm60^ %5d %12d %4d %10d %s"
/* Used to see what can be seen from here. * Reads records that are delimited by a specifc begin/end tag. * into the next inputsplit. *  reading past the file-split in log file                  !!! yourjobIdBelowHere         !!! *  at the beginning of the map-00001 (second input split).